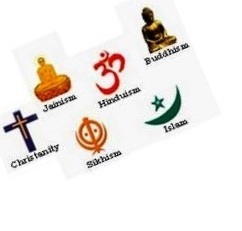 India is the birth place of Religions, India is a secular nation and has many Religions. There are several religions in India such as Hinduism, Buddhism, Sikhism, Islam, Jainism, Zoroastrianism and Sikhism. Indian religions is a major form of world religions next to the Abrahamic religions. Today, Hinduism and Buddhism are the world's third- and fourth-largest religions respectively, with around 1.4 billion followers altogether. India is one of the most religiously diverse nations in the world, with some of the most deeply religious societies and cultures. Religion still plays a central and definitive role in the life of most of its people. In India the Hinduism is in majority with around 80% of the population, Islam the second largest population of the country constitutes for around 14% of the total population of India (which is now 1.21 billion according to 2011 Census). Other religions like Buddhism, Sikhism and Jainism are in Minority. Christianity is the third largest religion in India. Other religions which constitutes the population of India are Zoroastrianism, Judaism and the Bahais or Bahai Faith (Bahai followers constitutes around 4 million in world population).